Desmodium canescens. R_al Sarrazin Canadian Wild Flowers.www.fleurssauvages.ca. gobotany.newenglandwild.org. (Accessed 5/2014). 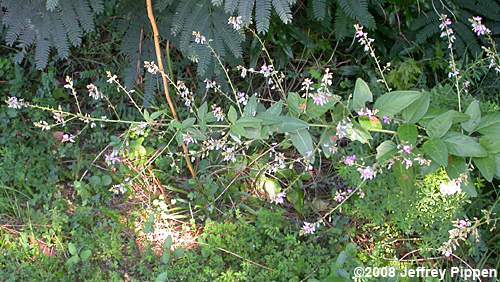 Desmodium canescens is a perennial herb, 0.6-1.5 m tall, from a brown taproot, aerial stem much branched, hairy, hairs with hooked tips (use lens); stipules persistent, asymmetrically egg-shaped, 0.6-1.2 cm long, tip pointed. 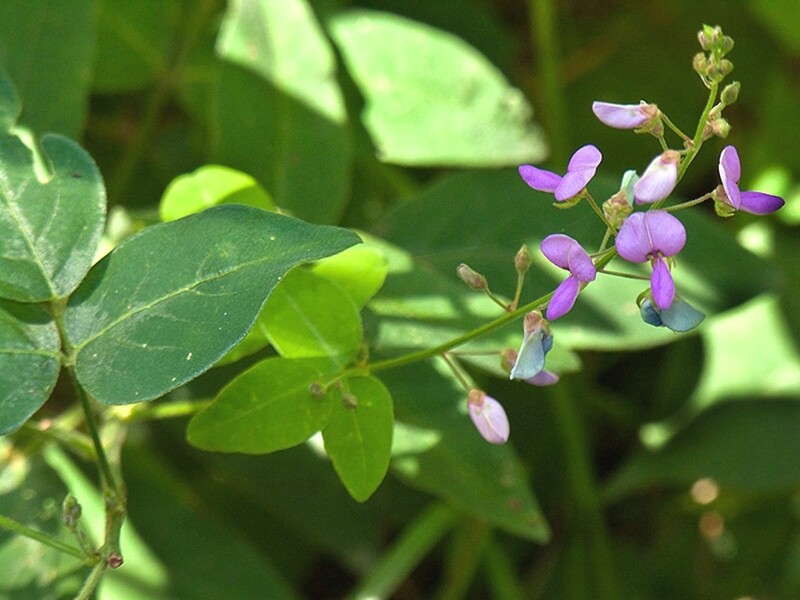 Desmodium canescens. 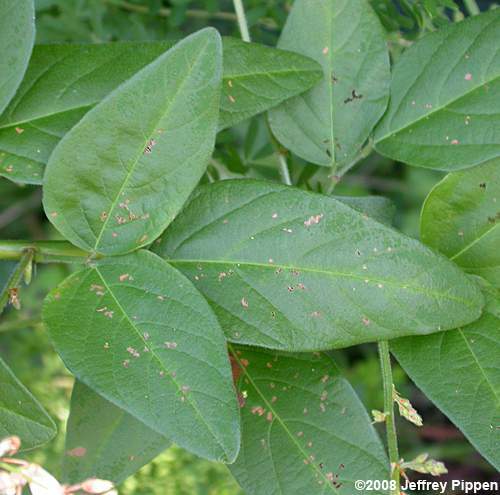 Desmodium canescens leaves. © 2008 Jeffrey Pippen. jeffpippen.com (Accessed 2/2018). Leaves alternate, 3-parted, terminal leaflet to 5-13 cm long, 3-10 cm wide, much longer than stalk of terminal leaflet, leaflets broadly egg-shaped, tip pointed, base rounded, finely hairy below. Desmodium canescens inflorescence. © 2008 Jeffrey Pippen. jeffpippen.com (Accessed 2/2018). Flowers pinkish, becoming green to white, pea-flower-shaped, 1 cm long; inflorescence diffuse, of widely branched clusters of racemes; blooms July-Aug.
Fruit dry, jointed between seeds into 4-6 segments, each semi-rhomboidal, to 1.3 cm long 0.7 cm wide, upper margins curved, lower margin somewhat pointed, surface densely hairy, breaking between seeds, dispersed by sticking to fur or clothing (Matlack 1994). Seeds eaten by some birds and small mammals (Martin et al. 1951). Habitat: Open woods, fields, sandy soil.